An MBTA bus in Watertown. Following days of initial testing, the Town of Watertown has debuted two “queue jump” lanes at School Street and Walnut Street. Queue jump lanes allow buses to move more quickly through intersections by “jumping” to the front of a line of traffic. Bus rapid transit (BRT) systems around the world use queue jump lanes to create a faster and more reliable bus ride and improve overall traffic flow. proceed without waiting for a green light and enable buses to move to the front of the traffic line and through the intersection without delay. 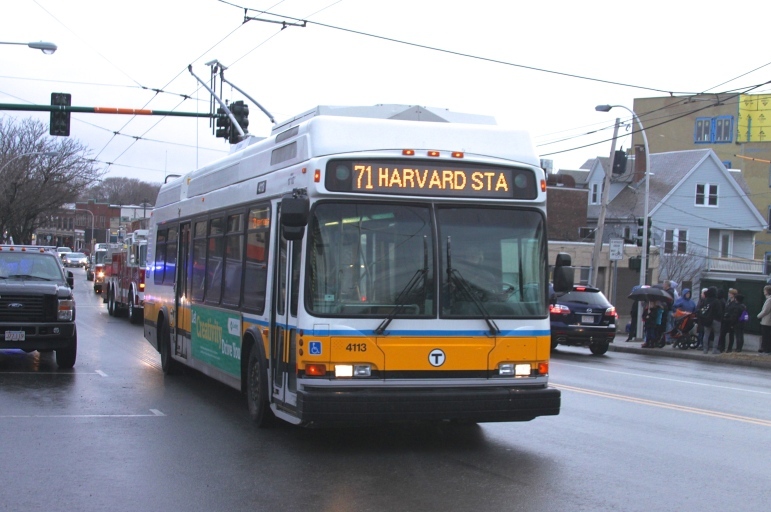 The queue jump lanes are a ramp-up to a larger pilot to test BRT elements on the Route 71 and Route 73 bus lines through Watertown and Cambridge. The full pilot, set to launch in October in collaboration with the City of Cambridge and the MBTA, with funding from the Barr Foundation, will also include a dedicated bus only lane down Mt. Auburn Street in Cambridge as well as innovative new signal equipment that gives buses a head start moving through intersections. More information on the pilot is available at CambridgeMA.Gov/MtAuburnBusPriority. Is there any reason why the author of this article did not mention what the goal was regarding time savings of this jump lane trial. I had read earlier that the time savings goal of a bus on Mt Auburn Street with the complete streets program was only a minute of two. I sent an inquiry to the town to validate what I read regarding time saving goals for a bus a few weeks ago but did not receive a response. A few questions are apparent. “Following days of initial testing” – so with this initial testing how is it evaluated? Do you survey the riders on the buses? People stuck in traffic during the morning and evening grid lock? Bikers? Also, What about the idea of losing the grass area of the sidewalk along the stretch of the cemetery and incorporating that into the bike/ bus lane. Buses and bikes should be able to share a lane. Some fuzzy areas are not apparent to us commuters.